What is the maximum number of novels or plays a person can write in his/her lifetime? 50? 100? 200? Will you believe me if I say here is an Odia playwright who has written more than 500 (most likely close to 800) plays? Will you believe me if I add that most of those plays have been extremely popular among the audience—when performed on stage and/or broadcast on radio? Yes, such a person, whose ‘prolificity’ did not, in any manner, come in the way of his ‘class’, did exist among us in flesh and blood. He still does—albeit in our collective memory. Gopal Chhotray—whose birth centenary was celebrated yesterday—was not just an extraordinarily successful playwright; he was an institution in himself. And before you take that as cliché, let me explain what exactly do I mean by that. Gopal Chhotray was associated with all the possible platforms where a play could be performed—stage, radio, cinema and finally television. He experimented with all kinds of themes—social, family, historical, mythological… And when it came to performance of a play, both on stage and on radio, he was involved with all aspects of its production—from choosing of characters to dialogue delivery to music. Even when stalwarts like Pandit Balakrushna Dash or Akshaya Mohanty would be in charge of music, Chhotray would ensure that the note that he wanted sounded just right. But the unassuming way in which he would do that ensured that all he got from these great people was respect, nothing else. Yet, the true greatness of this man lay neither in his prolificity nor in his versatility. It lies in the fact that—and I have the advantage of saying this in hindsight—in a career spanning half a century, he almost defined and shaped Odia drama as a genre—warding off some mindless external influence that Odia theater was beginning to pick up in the post-Kavichandra phase. For long, he almost carried it on his shoulder. Don’t get me wrong. It is not to suggest that he was better than others. Take Manoranjan Das, probably the only other name an average Odia would take alongside Chhotray’s when quizzed about Odia drama literature. Das, incidentally, was a colleague, contemporary and very good friend of Gopal Chhotray. (Trivia info: Devdas Chhotray, Gopal Chhotray’s son and noted Odia lyricist actually performed in many of Manoranjan Das’ radio plays, not so much in his father’s plays). As a playwright Manoranjan Das—who has inspired a lot of researchers to study his creation—was extremely talented. But if his plays impressed the critics more than the audience, it was because he experimented a lot—and many a times, was way ahead of his times. Gopal Chhotray came from a solid theater background and always had an ear to the ground. It is to his credit that he never used that advantage to just play to the gallery. On the other hand, he experimented and introduced new ideas, both in theme and presentation—but keeping the audience in mind. He defined, shaped and ‘cultivated’ the taste of Odia drama audience. This contribution of Chhotraty—shaping an entire genre—to my mind, is a far greater contribution than creating some great pieces of individual plays. Alongside people like Kavichandra Kalicharan Pattnaik, Balakrushna Dash, Akshaya Mohanty and Kanhu Charan Mohanty, Chotray’s name should be taken as a great influencer of popular culture in post independent Odisha. It is to his credit that he used this influence to do more than just ‘successful’ and ‘experimentative’ work. Like a true cultural leader, he took it on his shoulders to do more for the community. One was to revive traditions and (as I have written above) thereby ensure that Odianess remains in Odia drama. Take his single-handed effort to resurrect the legacy of Ganakabi Baishnab Pani’s rural street plays. By writing and composing his geetinatyas following the patterns and musical scores of Baishnab Pani’s geetinatyas for All India Radio, Chhotray, for the first time, got the poet of masses (ganakabi) to the classes. For the first time, Pani was in the drawing room of the urban households. In fact, to the people of my generation—I grew up in the 80s—Chhotray is best remembered for these geetinatyas like Ganesha, Janmashtami, Napahu Rati Namaru Pati, Mahishasura Mardini, Sampurna Ramayana, Bindu Sagara and the like. Janini mu kie Siba kouthi ta ghara, Kandile ki heba karindra gamana Indra ki sahaje chhadiba, Dina ganutha ganutha mesha chhiati, Bindu bindu tirthakalare purna e saroabara still reverberate in our minds. The list, of course, willingly leaves out the most popular of them all—Patent Medicine. That deserves special discussion. If Chhotray resurrected Baishnab Pani, he gave new kind of popularity to Fakir Mohan’s Patent Medicine. In a recent Twitter poll, we asked the Odia tweeple what their favorite Fakir Mohan work was. Patent Medicine scored above even Chha Mana Atha Guntha (and Rebati, Daka Munsi). In the discussion that accompanied, many had no hesitation in admitting that it was Shrimati Samarjani, the geetinatya version of Patenr Medicine that is etched in their minds. Many also explicitly said it was Chhotray and Akshaya Mohanty who should share the credit for taking the work to a new level of popularity. Just to reiterate, many even tweeted lines from it—from Babu hei jebe kabu kala mote to Epakhe das sepkahe das; from Makara to helu pagala to Na Sulochana kolata chuna. By the way, it is four decades since it was first broadcast. It is probably apt to share the genesis of the geetinatya. 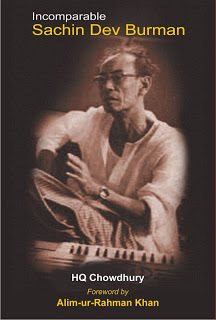 Gopal Chhotray had adapted works of many great writers to stage and radio plays. Among Fakir Mohan’s works, he had adapted Mamu andChha Mana Atha Guntha among others for radio. Patent medicine was, however, first written for stage. It was even staged in the Collegiate School in early 60s, with Hemant Das and Urvashi Tripathy as the lead pair of Chandramani Babu and Sulochana Dei. But after success of mythological geetinatyas on radio, Akshaya Mohanty suggested that Chhotray adapt Patent Medicine to a geetinatya form. While it was a big challenge to present a social story to a melodramatic geetinatya form with so many songs, Chhotray took it up. The rest is, as they say, history. Not only did it go on to win All India Radio’s pan-India award for best radio play, it created a cult work in Odia—with a modern theme presented in traditional Odia musical style. Imagine Akshaya Mohanty using an Odissi tune To lagi gopadanda mana re kalia suna in a Fakir Mohan social! Yet, these geetinatyas are only a small fraction of Chhotray’s work. To the older generation, his plays such as Para Kalama and Bharasa (originals) as well as the likes of Jhanja, Amada Bata and Malajanha (adaptations) are the ones that define Gopal Chhotray. He has written screenplays for more than a dozen Odia movies, including such notable movies as Shri Jagannatha, Maa, Nua Bou, Amada Bata, Abhinetri, Matira Manisha, Kie Kahara, Adina Megha, Dharitri, Bandhu Mohanty and Badhu Nirupama. As you can notice, most of them are strong adaptations. Unfortunately, not a single original of his—many of them very successful on stage—has been made into a movie. It should also be noted that for Malajahna, the movie, which got some rave reviews, especially for the music scored by Akshaya Mohanty (his first as a composer), was not based on Chhotray’s screenplay. This was because he had earlier committed to someone else for that, though that was never made. But being a man of words, he stuck to his promise and politely declined to do the screenplay for Malajahna, which Akshaya Mohanty was co-producing. Today, Odia is a recognized classical language. Outsiders are a lot more interested in studying the language and culture of Odisha. Odia gananatyas are a multi-crore industry. Yet, somewhere the distinct yet liberal popular Odia culture, whose foundation was built by the likes of Chhotray, seems to have lost its vibrancy, between the rampant copying and ‘lifting’ culture on one hand and the ultra-conservative puritanism that frowns even at healthy cultural exchanges, on the other. Recently, I came across this newly-released Odia album titled Ghazal Gajaratie. The album features eight songs written by well-known lyricists of Odisha—the likes of Devdas Chhotray, Mohit Chakraborty and Arun Mantri—set to tune by noted composer Lakshmi Kanta Palit. All the songs have been rendered by Mitali Chinara, one of the most mature voices in contemporary Odia music. The album is the latest example of a trend in Odia music being seen in the last few years: experimentation by a few musicians who are challenging creative limits without an overtly commercial consideration—combining some of the finest lyrics with matching music, that goes beyond the ‘formula’. I wrote about the trend in this blog more than three years back. A lot has happened since then, though. Most of the songs in the album, Ghazal Gajaratie, are clearly above the ordinary. The composer’s stubborn refusal to succumb to today’s dominant trend—excessive orchestration—contributes immensely to make the album stand out. Two songs—the title song, Ghazal gajaratiye and Mo gajara mahakigala—are extremely sensuous. Most of the lyrics are not overtly heavy and can appeal to both common listeners and connoisseurs. In short, Ghazal Gajaratie is an excellent addition to the genre of Odia experimental music. The only issue: it is not a ghazal album. Seven out of the eight songs in the album are not ghazals, the only exception being Katha thila dine, penned by Devdas Chhotray, the seventh song in the album. The lyrics are great, the music is superb, rendition is heart touching; the songs would have sounded as good, even if the album was known by any other name. I do not understand what was the incentive to use the word ghazal in the title. Does the word sell more? By ‘sell’, I am not necessarily referring to commercial sales of the album but broadly the perception about the quality/stature of the work. Does it sound more artistic or intellectual? Some time back, I had come across another Odia album in YouTube, called Ghazal Sandhya, sung by an artiste, Sangram Mishra, who happens to be the sole lyricist in the album. Unlike Ghazal Gajaratie, the music, lyrics and rendering are all below average, to put it mildly. Yet, there is something that is common between the two albums: the attempt to label non-ghazals as ghazals. What is so fascinating about calling some songs ghazals, when they are clearly not? For the uninitiated, ghazal is NOT a form of music; it is a form of poetry with clearly defined rules. Though all poets have not followed all the rules all the times, there are some basic requirements that must be met to call a poem a ghazal. In short, a ghazal is a collection of sher‘s of equal behr. A sher is a two line poem. Behr is the meter. It must satisfy some rules to be called a ghazal. In a ghazal, there are one/more common words that are repeated in both the lines of the first couplet (sher) and then in the second line of each subsequent couplet. These common word(s) are called radiff. There’s one more requirement. The word preceding the radiff in each couplet must rhyme. This is called kafiya. The first sher is called matla. The last sher usually contains the pen name (taqallus)of the poet. This is called maqta. The shers must independently stand on their own, though some time together they may express one central idea. Anyone desirous of understanding it with illustration, can refer to this very good explanation here, which uses Ghalib’s famous ghazal Koi umeed bar nahin aati to illustrate. Later in the text, I will illustrate the rules using an Odia ghazal as example. The above is a very brief description of the basic rules of poetic form. Then, of course, is the theme. Usually, ghazals are pessimistic and are a male expression. This is in contrast to thumris in Indian classical music, which are female expressions, and though often they are complaints against the beloved—as in many Radha-Krishna themed thumris—they are not pessimistic. There’s always a craving for reunion; never hopelessness. The third element is singing style, ghazal gayaki. That is dependent on culture and while Urdu ghazals have evolved in a particular manner which has impacted its singing style, I feel there is no reason why ghazals in other language should overtly follow that. But that is another debate, for another day. For the present discussion, I will not venture into that territory. My idea here is to factually present some lesser known facts about Odia ghazal singing, a sort of quick history. The history of ghazal in Odisha is not too old. And not surprisingly, the experimentation was started by the one name that we associate most experiments in modern Odia music and dance with: Kavichandra Kalicharan Pattnaik. He included a ghazal in one of his plays, way back in 1925. But I will not get too much into ghazal writing here. Some researchers like Mohammed Ayub Kabuli have written extensively on that. The subject has also been dealt with by eminent Odia poet Haraprasad Das. I will try to keep myself to some info on ghazal singing in Odia, though ghazal writing and singing cannot be completely separated. The person who really consciously pursued writing and singing ghazal in Odia was none other than the king of all experimentation: Akshaya Mohanty. He and some of his accompanying lyricists, most notably Devdas Chhotray, did experiment a lot with ghazal writing. For some strange reasons, Khoka Bhai (as Mohanty was popularly known) recorded only a handful of his own written ghazals. He published a book of ghazals called Geeti in 1968. In 2001, a little before his death, many of his ghazals published in Geeti as well as some new ghazals were published in a book, Madhushala, edited by Dr Renubala Mishra. But from the 50 ghazals that find a place in Madhushala, I could locate public recording of only three, two of which I could find in YouTube and have included the links. The link for the third, Maribaku thila, is to Saregama site where one can buy the song, after a short preview. I could not locate it on YouTube. In addition, this is another one of his own written ghazal, which is not included in Madhushala. He has recorded a few more for All India Radio, which are not available publicly. Some such ghazals include Tuma pare ki rakhibi bahrasa muhin, Ama duhinka marame dashichhi and Dukha mo rahichhi. Akshaya Mohanty has rendered quite a few ghazals written by Devdas Chhotray, including a couple of them in movies such as Badhu Nirupama and Papa Punya. Here is one from Papa Punya, which the lyricist wrote as a poem named Umrao Jaan, which was later used by Khoka Bhai in the movie. It is rendered by Haimanti Shukla. Though Akshaya Mohanty willingly flouted some rules of the ghazal—such as using the radiff in both the lines of the matla or using a rhyming kafiya—he stuck to the basic rules of behr and radiff. I am using his Kalankita ei nayaka akhiru to illustrate. Though in terms of poetic quality, this is not among the best of his 50 ghazals in Madhushala, I have taken this because this is by far the most popular among his ghazals and this, unlike many other, conforms to the basic rules of the ghazal more than many others. In this, the first sher, Kalankita ei…is the matla. He has not used the same radiff in both the lines. But thereafter, he keeps to the rules, with ‘kari‘ as the radiff and rhyming kafiyas such as papa, gapa, mapa and dipa. Yes, one can repeat a kafiya. The use of maqta is evident. In all his ghazals, he uses his own name Akshaya instead of another taqallus. Interestingly, this is the most commonly flouted rule of ghazal. In filmi ghazals for example, there is little scope for the lyricist to use a maqta. So, usually you do not find maqtas in film ghazals, though someone like Khoka Bhai, with such a high self-esteem has never missed on this element. In many of his ghazals, he does not keep to the kafiya rule; i.e there are no rhyming kafiya but this one clearly has it. The sole ghazal by Devdas Chhotray in the new album Ghazal Gajaratiye that I referred to in the beginning, does not have kafiya. Beyond the basic poetic construction, Akshaya Mohanty has always kept his ghazals in the true spirit of ghazal. They are always pessimistic, defeatist, hopeless, self-blaming…in the classic tradition of Urdu ghazals. It is really a pity that most of his ghazals are not available in recorded form. Recordings of some of his private sessions prop up here and there and listening to them convinces one how much he internalized even ghazal gayaki. It is intriguing why he did not record them for public. After Khoka Bhai, the real good ghazal album that was released for public after long was by Subhash Dash. Simply called Odia Ghazals, this album, based on songs penned by poet Laxmidhar Nayak, was released by Saregama. Dash sang all the songs that were taken from poet Nayak’s ghazal compilation book, Ghazal Jharna. You can find all the songs here, though because of some technical error in Saregama site, some Sambalpuri songs of Fakir Patnaik are also shown as being part of this album. The trio of Devdas Chhotray, composer Om Prakash Mohanty and Susmita Das, who have set a trend in Odia experimental music, have their share of contribution to Odia ghazals too. In 2008, they released an album, Hati Saja Kara, which contained two ghazals: Janha achhi aau bijuli bi achhi and Sneha ta bahuta milila jibane. Two years later, they released another album, Nua Luha Puruna Luha, which was, by far, a full-fledged ghazal album, with most songs being ghazals, though many of them did not have kafiya and same radiff, instead setting for a rhyming radiff like many of Akshaya Mohanty’s ghazals. Songs like Mu ki janithili mu nije ete sundari boli, the first song, belongs to that category; but the reason it stands out is that it explicitly refers to the shayar with a feminine adjective, a rarity in ghazal. Other ghazals include Diena sneha tike je, Mu ta bhala thili mora eka eka, Mora thila sabu bhul mu manuchi, Tume luchauchha shaha pare shaha, Chahini magini janini kemiti, Jibaku thila duraku tenu bahana khojinela, Se dinara chhabi sabu, and Dukhara dhari hata. I believe some of the ghazals of Devdas Chhotray have been rendered by other artistes too but I do not find them online anywhere. Haraprasad Das has written some nice ghazals which, to the best of my knowledge, have not been recorded. The fascination for the word ‘ghazal’ by Odia musicians means there is a perceived value seen in ghazals. Unfortunately, few work consciously towards popularizing the genre. I am sure there are lots of poets in Odia who have been writing ghazals. A ghazal compilation with the selection from Khoka Bhai’s ghazals as well as others down all these years, recorded in the voices of leading singers of Odisha, would be a great addition to Odia modern music. Devdas Chhotray, as the most notable living ghazal writer in Odia; the most important personality in this new experimentation wave in Odia music; and above all, the bridge between the generation of Akshaya Mohanty and of today, could arguably be the best person to drive such a project. “Tell me what you eat and I will tell you who you are,” said French thinker Jean Anthelme Brillat-Savarin, considered by many to be one of the founding fathers of modern gastronomics. English art critic Clive Bell, in his famed essay Civilization, has illustrated the difference between the cultural standards of the French and British through an explicit example of differing standards in taste of food. Over the ages, food has been one of the most important indicators of a society’s cultural status. Measured on that account alone—yes, leaving aside all its rich (and now famous) visual and performing arts—Odias would be considered a highly civilized people. Food—and in particular, variety of food—is one of the most important defining factors of Odia culture, as exemplified by the ‘food habits’ of Lord Jagannath, not just the presiding deity of Odias but the most powerful cultural symbol of the Odia identity. Each festival or ritual in the Jagannath temple would have a specific food item in the form of prasad associated with it. Even on the day of Rath Yatra, the biggest festival in Odisha, the big chariot of Lord Jagannath, Nandighosha, actually stops on the way so that the Lord can have His favorite podapitha (a special sweet cake made in Odisha), at His MousiMaa’s (aunt) place on the way to His destination. And when He is back to the temple after an eight-day sojourn, and the upset wife, Maa Laxmi needs some real placating, the gift that does the trick is a food item; one that you are probably familiar with: yes, the omnipresent Rasagola, which many erroneously think to have originated from Bengal. The offering was made, at least 200 (and most likely more) years before it started selling in Kolkata and was assumed to be a Bengali sweet! Such is the importance of food in the cultural life of Odias! It is not surprising, therefore, that food occupies an extremely important place in Odia creative arts, including its music. It is not uncommon to find reference to food in folk music around the world. But in Odisha, food gets a prominent place in not just the folk music, but its classical, semi-classical and modern popular music. Why, even devotional feeling often comes wrapped up with powerful symbols and craving for food/prasad of the Lord! In one of the most popular bhajans, Jagannathiara SriMahaprasda pagala kala re bhai, the lyricist actually proclaims that it is the love of the Lord’s prasad that made him rush to Puri, without any delay! While that bhajan is not explicitly about food, there are many that are completely focused on celebration of food. Here is a look at some of the most popular among such songs. Many other songs would passingly mention food or use it as a metaphor. I have not looked for those ‘mere’ words but kept myself focused on what can really be called songs celebrating food. There are film songs, non-film modern songs, Odissi lyrics and bhajans focused on food. So, here we go. The links are embedded in the song names. This bhajan by Arabind Muduli is a celebration of abadha (though pronounced as abhada), the cooked prasad of Shri Jagannath. 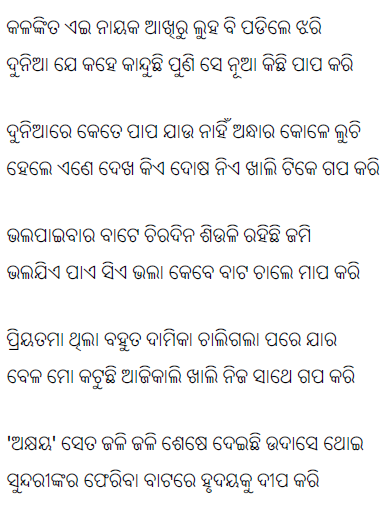 The evergreen song written by Kavichandra Kalicharan Pattnaik in the voice of Pandit Balakrushna Dash, the father of modern Odia music, celebrates the most common food of Odias, pakhala. This is about another traditional Odia food, chuda chakata, again, in the voice of Pandit Balakrushna Dash. Though chuda or poha is eaten in many places, the way it is eaten in Odisha is fairly unique. And that is exactly what the song celebrates. Kanji is a typical Odia dish made from torani (water taken from Pakhala) or peja (water taken out after boiling rice) and cooked with vegetables. Some joke that the song made it more popular across all regions of Odisha. This song in the voice of Arjun Charan Samal, a singer known for his rendition of palligeetis, is a craving and description for traditional food prepared in Odia homes in villages. A round up of all Odia pithas (indigenous cakes) and their shapes, it is not fully about food or anything. The inimitable style of Akshaya Mohanty just uses some rhyming words to appeal to the average man on the street. While the lyrics is not exactly world class, most of the words are colloquial Odia words and connect immediately. This celebration of eating mudhi (or moori, as some write it as) in the Odia style completes the triology of food songs by Pandit Balakrushna Dash. Though not as popular as the pakhala song, this one explicitly makes a claim: that only an Odia recognizes the pleasure of eating mudhi with nadia (coconut) and then goes on to describe the right setting and the preparation to maximize the pleasure! In this Odisssi lyrics, rendered by great Odia singer and composer, Prafulla Kar, Radha craves for diet, all of which bear the name of Krishna. There are many more. These are just some of the more popular Odia songs celebrating food. As Odias are all set to celebrate the 1st Rasagola Dibasa on 30th July, let’s have plenty of music, food and music about food.